A Capstone StudyUSA Higher Education Fair, at which the overwhelming majority of representatives are from the participating institutions. What’s in a name? When parents and students make the decision to attend a US higher education fair, what are their expectations regarding who will be sitting behind the nicely decorated tables? To enter the ballroom and see a group of mostly student volunteers representing US institutions of higher education; or. To have the opportunity to meet with official representatives of US colleges and universities. Color me transparent but companies that organize and advertise fairs at which educational institutions are represented mostly by local student volunteers are cheating students, parents and other members of the public who come seeking accurate and detailed information from bona fide representatives of the home institutions. 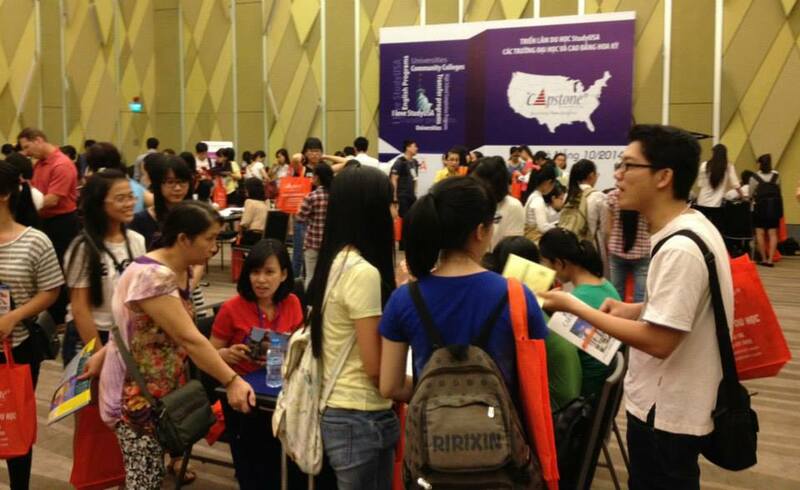 Even though higher education fairs are free and open to the public, attendees not getting what they paid for in terms of time and effort expended to travel to the hotels that host these events if they only have the opportunity to meet with mostly Vietnamese student volunteers. The companies that put on these dog and pony shows are some of the same ones that bus students to fairs to artificially inflate attendance, hire companies to pay “students” to attend the fair, buy “likes’ for their Facebook fanpages rather than growing them organically, try to inflate the number of upvotes on its YouTube videos (without realizing that Google has technology to monitor viewer activity and prevent this type of fraud – just Google “YouTube” and “301+” to learn more), use the names of well-known companies in Google AdWords in a lame attempt to drive traffic to their websites, etc. It’s all smoke and mirrors, a disturbing pattern of deception. Only those foreign higher education fairs that have at least, say, 75% foreign representatives should be permitted to use the name. Others should be forced to explain the truth about their faux fairs, including a disclaimer on their website and in all advertising. (A guy can dream, can’t he?) Anything less is fraud perpetrated on unsuspecting students and parents. Mark can be counted on to be a truth teller in Vietnam. His organization can be counted on to always do the right thing. what if schools can’t travel and they are willing to pay for the student volunteers, and they are all well-trained? well it’s also up to schools’ decisions and budget. Sometimes they want to save money- and to try new fairs in the market. That’s great. The problem arises when fairs have, say, between 80-90% Vietnamese student volunteers representing foreign HE institutions. I think parents/students should know what to expect. In fact, most expect to see foreign reps not mostly Vietnamese students. As mentioned, it’s a type of fraud. There are any number of fair names you could come up with that reflect truth in advertising, in addition to including this disclosure in the description. Companies that perpetrate this type of fraud also realize that perhaps fewer people would show up if they knew what they were getting, hence the smoke and mirrors deception. “buy “likes’ for their Facebook fanpages” – So if someone (I guess your company does that too) places ads on FB, it is also considered cheating? I DISAGREE! Ryan (?) – I think you’re confusing buying FB ads w/ buying “likes” in order to make your page appear more popular than it really is. There is a difference. If you think it’s OK to buy “likes,” then we can agree to disagree.